Global algae biofuel market expected to generate revenue of around USD 9.88 billion by end of 2024, growing at a CAGR of around 8.6% between 2017 and 2024. Algae biofuels are obtained from several algae species such as Chlorella species, Tetraselmis suecia Botryococcus braunii, Crypthecodinium cohnii, and Nitzschia species. The report provides a comprehensive glance of algae biofuel market on the global and regional level. The study gives historical data from 2015 to 2017 along with the forecast from 2018 to 2024 based on both revenue and volume. The study includes major driving forces and restraints for the algae biofuel market along with the impact they have on the demand within the forecast period. Additionally, the study also provides the major growth opportunities of global algae biofuel market. The global algae biofuel market study also comprises the detailed value chain analysis for providing a comprehensive view of the market. Moreover, the study also includes Porter’s Five Forces model for algae biofuel, to understand the competitive landscape of the global market. The study includes a market attractiveness analysis of all the segments related to the market. The study provides a significant view of the global algae biofuel market by classifying it into type, application, and region segmentation. These segments have been estimated with the future and past trends. On the basis of type segment, the market has been segmented into bioethanol, biodiesel, methane, jet fuel, biobutanol, biogasoline, green diesel, and others. The key applications in the report have been segmented into transportation, aerospace, and other applications. The regional segmentation includes major five regions such as the Middle East & Africa, Asia Pacific, Europe, Latin America, and North America. Also, it is classified into major countries such as the U.S., UK, Germany, France, China, Japan, India, and Brazil. 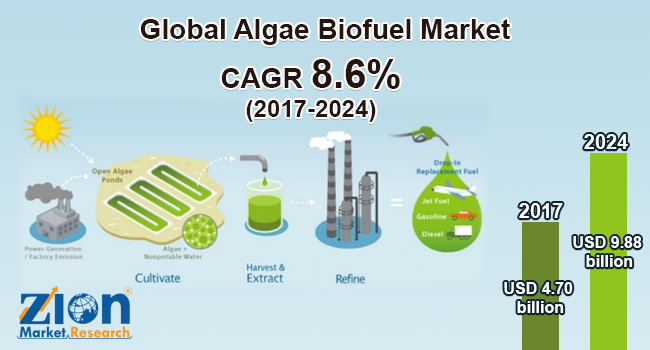 Major manufactures of global algae biofuel market include Algenol, Blue Marble Production, Culture Biosystems, Sapphire Energy Origin Oils Inc., Proviron, Culture Biosystems Genifuels, Algae Systems, Solix Biofuels, Solazyme Inc., and Reliance Life Sciences, among others.